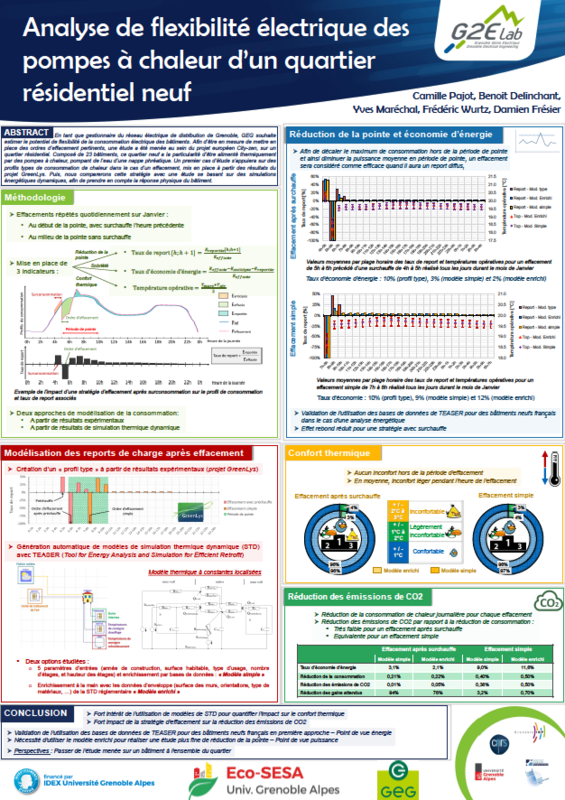 On the occasion of the IBPSA conference that took place on May 15 – 16, G2Elab presented an “Electrical flexibility analysis of heat pumps in a new residential neighborhood”. This study* was realised in collaboration with GEG, University Grenoble Alpes, CNRS and Grenoble INP. Abstract – As Grenoble electrical DSO (Distribution System Operator), GEG whishes to estimate the flexibility potential of the buildings electrical consumption. In order to establish efficient load shedding orders, a study has been realised on a residential district. Composed of 23 buildings, this new district has the specificity of being fed by heat pumps. In a first part, a study case will rely on typical heat consumption profiles in case of load shedding, created from the GreenLys project results and from a study led by RTE. Then, this strategy will be compared with a study based on dynamic energetic simulations to take into account the physical behavior of the building. The results of this study are of interest to GEG and ATOS, particularly in the context of actions carried out on the European project, City-zen.